Improvements on Franklin Street, between Normal and Jefferson streets, were recently completed and include a newly paved road and bike lanes. 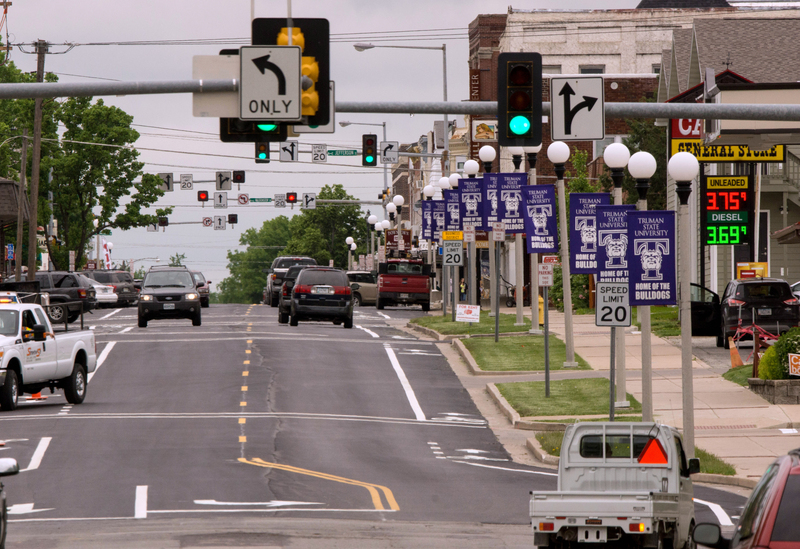 The portion of Franklin Street that runs through the Truman campus from Patterson to Normal streets is getting a new look that includes new pavement, lighting and sidewalks along with the addition of bike lanes in both directions. The plans also include a new center median with trees down the center of the street. 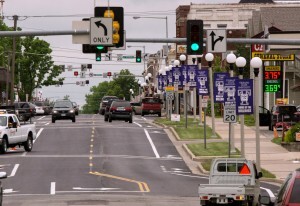 The project is partially funded by the Missouri Department of Transportation, and the anticipated completion date is in August 2013. 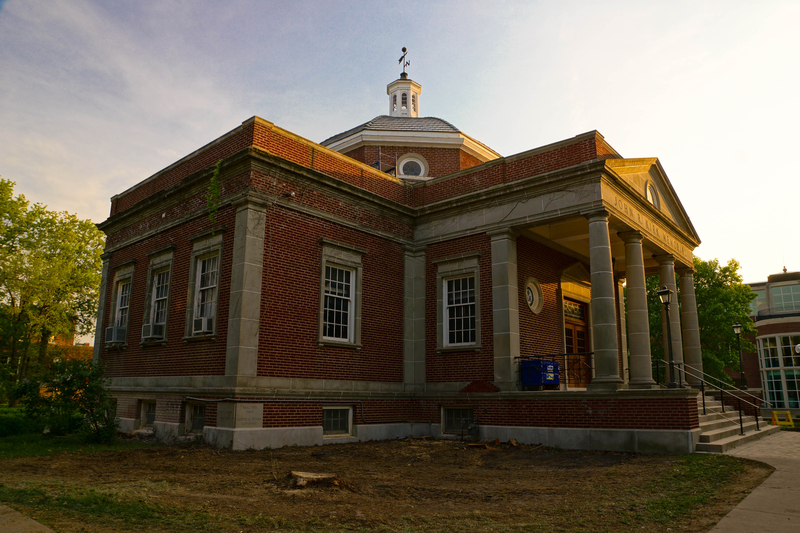 This summer, Kirk Memorial, a campus landmark which was built in the 1940s, is getting some much-needed repairs. In addition to replacing the cupola, improvements include new shingles and windows, brick tuck pointing and replacement of limestone detailing that has deteriorated. New plantings of trees and shrubs will be in keeping with the original design from the 1940s. Campus Planner Mark Schultz says the goal is to make the building water-tight and prevent further deterioration. Renovation of Centennial Hall includes the dining hall which will have new booths, tables and chairs, and a completely renovated private dining room. The dining room will be available during the evening for students to study and socialize. Centennial Hall is nearly midway through a major upgrade that is part of the University’s campus-wide housing improvement project. During the first phase of the Centennial Hall renovation, the entire south side of the residence hall was closed for the 2012-2013 academic year. As the finishing touches were being completed on the south side earlier this summer, work began on the main lounge, dining hall and lounge areas. The north side will be closed for the final phase of the project, and the completion date is January 2014. The Centennial Hall renovation includes new heating and cooling, ventilation and sprinkler systems; a new electrical system throughout the building; new elevators; and new paint, carpet and lighting in the public areas. Once completed, the common areas, such as the lounges, dining area and hallways, will have new air conditioning. The floor lounges on the third, fourth and fifth floors are being expanded to more than double their original size, and the main lounge will feature a conference room and game room. 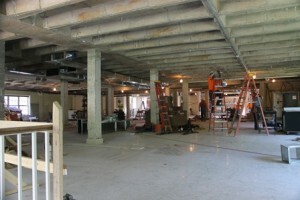 In addition, the dining area will have a new serving line and seating area along with an attached private dining space. A new elevator has been added that will take residents from the main lounge to the dining room entryway. In addition, a new chair lift will allow residents and guests who use a wheel chair easier access between the main lounge and the first floor. The building will be completely ADA accessible. Other improvements include a new data system for faster wireless Internet, new study rooms on the first floor and remodeled public restrooms. Exterior work is also being done on the roof, as well as the brick and concrete that has worn down over the years.